On January 12-14, pro-China propaganda groups linked to the Chinese government issued a statement and staged a protest against Taiwan president Tsai Ing-wen’s stopovers in the United States en route to and from official visits to diplomatic allies in Latin America. Tsai stopped in Houston on her outbound journey January 7 and arrived in San Francisco on her return journey January 13, angering China. 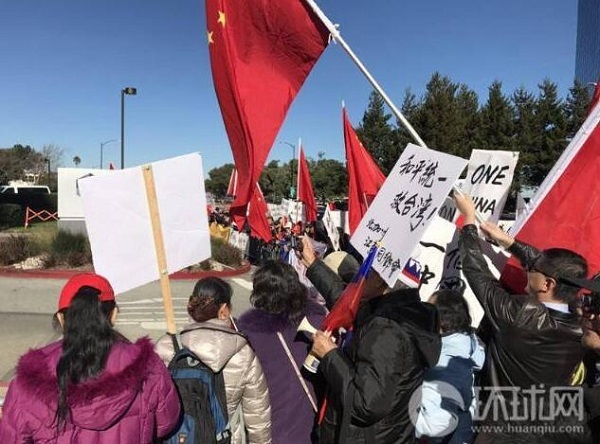 On January 14, pro-China demonstrators gathered outside Tsai’s hotel near San Francisco International Airport, waving red Chinese flags and shouting “One China, oppose Taiwan independence.” The protest received little attention in U.S. media but was widely reported in state-run mainland Chinese media as evidence of “overseas Chinese” support for Beijing’s “one-China” policy. While a brief mention at Reuters estimated the crowd at just over a hundred including supporters of Tsai, state-run China Daily claimed that 500 showed up to protest against Tsai’s visit and made no mention of Tsai’s supporters (See also China News, China Overseas Network, China Youth Network, China Radio International, Observer Network, Sina News). The Committee to Promote the Reunification of China-San Francisco Bay Area (舊金山灣區中國統一促進會 or 旧金山湾区中国统一促进会, CPRC-SF), likewise noted previously at Foreign Policy Blogs, was also among the protest organizers. Like CPU-NC, CPRC-SF has an extensive record of pro-China activities in the Bay Area, contacts with Chinese government officials, and a close working relationship with the Chinese consulate-general in San Francisco (See also U.S.-China Press, Jan. 11, Jan 12). These groups, as further noted at Foreign Policy Blogs, are only two of more than 30 such groups currently operating in cities and regions across the United States and some 200 operating in 90 countries around the world. All are overseas chapters of the China Council for the Promotion of Peaceful National Reunification in Beijing, a nominally “non-governmental” organization run entirely by Chinese Communist Party officials; and all work closely with China’s embassies and consulates abroad. The chief purpose of these organizations is asserting mainland Chinese territorial claims and undermining international support for Taiwan. 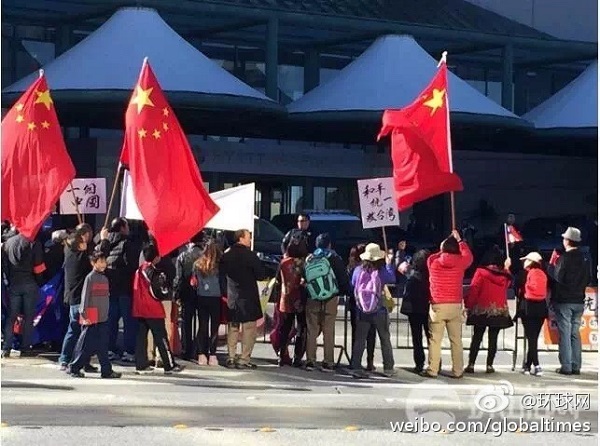 Given its established patterns of behavior, the Chinese consulate-general in San Francisco seems likely to have been involved with its allied groups in orchestrating these protests against the Taiwanese president’s visit to the Bay Area.